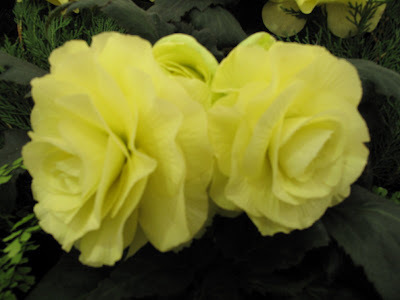 These beautiful lime coloured Begonias seen at Hampton Court RHS show yesterday have inspired me to write this post, something everyone, but particularly gardeners and especially journalists should know. The Infectious Diseases Society of America’s new Lyme disease guidelines review panel will hold a one day hearing on July 30 2009. This hearing is part of the antitrust settlement that the Connecticut Attorney General negotiated. On May 1st of 2008 the Att. General announced this review, after investigations of the previous panel members had found significant conflicts of interest financial in Insurance,Vaccine production and research. They were found to have excluded members from the board who had a divergent point of view and had excluded research articles that had a different view whilst supporting their view by their own research. It's an unprecedented action - the first time a medical society has been investigated and forced to re-examine its guidelines. These guidelines are considered authoritative in countries throughout Europe including of course UK, also Canada as well as America. Although as their name suggests they are GUIDELINES they have been used to refuse patients treatment and to take disciplinary action against doctors who choose to treat following alternative guidelines. Alternative Guidelines are those written by International Lyme and Associated diseases. They believe that Lyme is not rare, is not simple to cure for many people, ongoing symptoms can be indicative of ongoing infection and that blood tests are unreliable. They have a considerable body of research that supports their opinions which are being ignored by IDSA. Sadly the new review board was convened with members from the IDSA and excluded any doctor treating patients following ILADS guidelines so already there is a bias, including one member an ex president of IDSA who has already spoken out publicly against ILADS and in support of IDSA guidelines, before even looking at the evidence. There have already been many representations made to the review board from 43 charities plus ILADS, Canada, a German speciality clinic and UK Lyme disease Action Charity, that I am aware of. In America 5 States have now passed legislation to protect their doctors, if they choose to treat differently than IDSA guidelines. A bill is hoping to be presented at Congress this year. In the UK many politicians have been supporting the charity Lyme Disease Action and asking questions in Parliament and writing to Health Secretary but each time they defer to the 'expert' at HPA who has written research with 2006 IDSA guidelines panel members and refuses to open her mind to the research supporting ILADS guidelines. Research has found Borrelia (Lyme Disease) to be as complex as TB and Leprosy and therefore difficult to treat in it's later stages. It is a spyrochaetal organism similar but far more complex than syphilis and so like syphilis can affect every system and organ in the body, thus presenting with a multiple of symptoms, Arthritis, muscle weakness, neurological, heart block, meningitis, psychiatric the list is endless. One video link I watched from some years ago said that 3 Lyme doctors in USA had between them treated 50000 patients. That number will be multiplied many times now. Dr Jones has treated 14000 children from every state in America and every country in Europe. I am in touch through Eurolyme with 2036 patients struggling with their health and treatment mainly from UK but also from every country in Europe. At Lyme Disease Action conference last year I listened to Dr Bransfield a psychiatrist who has treated many patients with Lyme Disease, recently he and Dr Jones have been finding that some children with Autism have been found to have Lyme and with treatment their symptoms improve. Dr Alan Macdonald a pathologist found borrelia in the umbilical chord and fetus and there is evidence to support that it can be passed like syphilis to the unborn child even when the mother may have a sub clinical infection. Dr Macdonald also found DNA for borrelia in the Hypercampus of 7 out of 10 Alzheimer's brains. Dr Judith Miklossy has done considerable research and has also found DNA in the Hypercampus of brains. She has found spirochetes in blood CNS and brains of every single one of 14 Alzheimer's patients on autopsy but not one of 16 control study. She believes that treatment by antibiotics can significantly relieve symptoms of Alzheimer's in many patients. CDC have recently acknowledged that Lyme Disease is of epidemic proportions and has been meeting with many of the Lyme Charity Representatives. The actual figure is considered to be 10x those from confirmed serological tests. In UK HPA figures last year were c800 so multiply that by 10 and then realise many of us suffer ten, twenty years of illness before diagnosis and successful treatment, you quickly start to realise it is a far greater problem in UK than is acknowledged by our NHS. Dr Jemsek a Lyme Doctor in USA, interviewed recently says that out of the top twenty illnesses only 2 have a known cause H.Pylori causing stomach ulcers ( how many people underwent unnecessary surgery before it was realised that it was a bacterial infection) and HIV. Dr Jemsek was at the forefront treating AIDS victims long before it was accepted world wide as an illness. He likens the denial of Lyme to the problems he faced in the early days of treating AIDS patients. Lyme is of far greater incidence than the case numbers of AIDS and West Nile virus added together according to CDC figures. Much of the above can be substantiated through links on the top right of my blog but I would be more than happy to find further information if required. Not only are people going undiagnosed and untreated but most importantly children are the most vulnerable. See on my blog role Lewis Jeynes sad decline into such terrible debilitating ill health from a healthy two year old toddling around. After three years of decline his family has finally had tests done in Germany that confirm he has Lyme Disease, now they have to struggle to get NHS treatment and may even have to go privately because of IDSA discredited guidelines which are being treated as mandatory still throughout the World. The documentary film Under our Skin is amazing, what might to the uninitiated seem over dramatic, to those of us who have suffered the devastating effects of Lyme and in my case overcome them, I can assure you it is an accurate portrayal. The trailer and many other clips can be seen on their website. The Film is currently touring cinema's in the States and is very well worth watching, even if you never have connections to anyone with Lyme you should see what is happening to your fellow citizens and with your Health care system. One day I would like to see it aired on National television and cinemas in UK. I have only read one Journalist's work who has in any way got into this controversy Pam Weintraube, again links on the right of my blog. Pam was a science journalist and herself husband and two boys suffered many years of debilitating illness before being diagnosed and treated. She used her skills as a science journalist to interview researchers and doctors as well as patients and patient advocacy groups. Her book Cure Unknown is mind blowing, her articles in Psychology today of which there are many, need to be aired in every National newspaper and not just in USA but especially in UK and also Canada. One doctor whose young son had been seriously ill with Lyme Disease recently said to me 'It is a medical disgrace', other doctors believe that it will eventually have significant impact on the treatment of many illnesses. Such an interesting info about the disease.... Cure for diseases is always there somewhere.., waiting to be found. Thank you for making such useful and detailed information about Lyme available. Looking back, I think I've had the infection for many years, but another tick bite when I was gardening at home in Hertfordshire a couple of years ago was the final straw for my overloaded immune system. The NHS weren't able to offer anything other than an eventual CFS diagnosis, but I didn't give up and found a private Lyme specialist via the Lyme Disease Action and Eurolyme sites. I've a long way to go before I'm free of this awful disease, but my quality of life is already improving. Keep up the good work! It's a very good post Joanne and I take my hat off for you. Very interesting and so much I didn't know or understand about Lyme disease. It seems like it was a very publicly discussed disease years ago here, but now you practically never hear about it. I had no idea there were still so many cases. Very interesting too about the possible link between Lyme and autism. I sure hope they can come up with some way of allowing doctors to treat it using different methods and tests, especially if their traditional ways don't diagnose it properly. I think it's great that you are helping to make others aware of this and the success found with long term antibiotic use. The following comment was left by Audrey Mc Cormick Edmonton Canada on my guest book I decided as it is so typical of so many stories I hear to post with other comments on Lime for Lyme. What a paradise you have created! And thank you for your efforts to educate others about Lyme Disease. My young daughter has chronic Lyme disease due to misdiagnosis 5 years ago when I.D. specialist misdiagnosed her classic Bull's eye rash as ringworm. Audrey I do hope your daughter is improving now that you have at last found a doctor who can and is willing to treat her. Best wishes. What an informative post this is. I'm sure you have helped many people who didn't know that they had it until reading your blog. This is great Joanne - keep up the good work! Joanne, what a lovely garden you have created and I am so pleased that you are now well enough to renew your work on it. Thank you too for all the information you are sharing about Lyme disease, a devastating illness that doctors and the general public in this country are only just beginning to become more aware of. Many people like me have been ill a long time, but were told they had ME , MS or Parkinsons, only to discover year later that they have actually got Lyme disease: had this been identified shortly after a tick bite and treated with antibiotics until several weeks after all symptoms subsided, it could probably have been halted in its tracks. Treatment years later, after much suffering, may take much longer and is more complex. The message to all gardeners, pet owners, parents with children playing in fields etc and people walking in the countryside is to cover up your legs and feet in particular; carry a tick remover; check regularly for ticks all over [including arms,elbows, scalp where possible and folds of skin ] , remembering that some can be as small as a sesame seed. We can't ignore the fact that there are more ticks and a rising percentage are infected with Lyme and/or co-infections, but we can decide to take evasive action and to be aware. Thank you for continuing to fight our corner, Joanne, I'm really proud of you and, despite only 'knowing' you through the internet, I've seen your considerable improvement and use you as an example to continue to spread the word. Actually spreading the word is probably what makes me sound like a bit of an evangelist. Although I know the information about possible misdiagnoses (CFS/ME/Fm etc) has helped some people, others cut me off completely, it's not very nice and makes me feel like a nuisance or a crank! I just wish someone had kept on at me (and my partner) because we could both have avoided losing chunks of our lives. Anyway, keep up the good work ... and loving your garden! Take care. Just thought I'd let you know that I live in (SW) Hertfordshire too and I have Lyme Disease, but I wasn't bitten in Herts (not as far as I know anyway!). I was bitten by a tick whilst on holiday abroad. Cambridge Keenan signed my guest book and left this message so I am copying here with this post. mother to her offspring, either via the placenta or through the milk. Second section, I should have said I know Laurence through Eurolyme he is a retired Vet sufferring with Lyme disease and has a better understanding than I have of this illness. enabling it to penetrate every cell in the body. known as Bell's Palsy of the Gut. It can affect nerves feeding glands leading to glandular effects. allergic situations when treated for Lyme. long courses are absolutely essential. Changing antibiotics can help. high-dose or multi-drug courses, can be needed. side effects". For example, you may develop an allergy to penicillin. place, the organisms would not have a chance to develop resistance. Babesia that cause the problems. The following was sent to me by Denise through Eurolyme as she also had problems posting. Thanks for putting all this information on your web site. Is it the cost of treatment that has seen most of us chronic Lyme sufferers labelled as having ME or Chronic Fatigue Syndrome or in your case Arthritis? There is so much controversy over this disease, yet people with TB get long term treatment - why is it so unfair? There was a front page news story over the weekend in a Pennsylvania, USA, with stories of people having delayed diagnoses and having to travel thousands of miles for treatment at great expense - then an academic, Dr Auwaerter, says antibiotics don't work and the patients must have Fibromyalgia or another disease instead. All those doctors like Auwaerter and the dozen or so who have published in the prestigious journals about Lyme being easy to cure and short-lasting - I ask myself how do they sleep at night? They are ignoring the overwhelming scientific and medical evidence of persistent infection. Some of them quite openly stated that there was persistent infection in their earlier papers in the 1980 and 1990s. What's made them change their minds now? They have somehow overlooked all the global research stating that the Lyme spirochetes are really just like Syphilis, hiding in the body and needing sometimes years of treatment? And somehow forgotten their own published papers. This would seem farcical if it were not so deadly serious. Perhaps twenty five years ago there were only a few thousand people with Lyme, and it was not too expensive for the insurance companies to allow open-ended treatment. But now - well, we have a world-wide problem, destroying lives on a terrible scale, which if the truth were to be known, is probably at an epidemic level in some areas. Look at the situation in Europe: in Southern Sweden the incidence in 2005 was 464 cases per 100,000 of the population; Holland reported 103 per 100,000 that same year. 464 per 100,000 - that's twice the level in epidemiological terms at which the situation is labelled as an epidemic. It's becoming obvious to anyone who spends a little time examining the literature and also looking at patient organisations and their well-informed advocates' evidence, that this tick-borne illness is complex, persistent beyond the normal short-term treatment unless caught in the very early stages, and able to cause havoc in both brain and body. Unfortunately for us in Europe, the USA seems to control the world, or rather, their insurance companies control the world, and also the press and the great institutions of learning and medicine. So it's been easy for journalists, doctors and scientists to go along with the insinuations that sick people are merely inadequates, and they can leave them to suffer with their labels of yuppie flu, ME or chronic fatigue syndrome, or too much stress, hysteria, somatisation etc etc. It's been easier to blame it on the patient. Do they actually realise how many extremely sick people have been denied disability payments or ill-health retirement? Or does someone somewhere in the lofty towers of the corporate insurance and hedge funds know that their profits will shrink if sick people are treated with compassion and the correct medical help? Money does rule the world but when the great and the wealthy suddenly realise that they cannot escape this disease, when their children and grandparents suffer from this new plague, they will come running to the very doctors they have tried to silence. I write as a person who suffered 19 years before being diagnosed, and I am still making new (IgM) antibodies to Lyme after repeated treatments over the last 5 years. The borrelia bug and the co-infections keep changing and our immune systems keep trying to beat them - we need far more science and research to beat this illness, not denial from the ivory towers of academia. One day the truth will out, but how many more people will suffer needlessly.